Combining multiple materials in complex structures let us use light in new ways. We crafted lenses and mirrors to make telescopes to peer out into the universe, and microscopes to explore the world of the small. Today this work continues, on a much more detailed level. My own research into what are called "metamaterials" explores how we can construct materials in ways that do amazing - and previously impossible - things. We can build metamaterials to respond in particular ways to certain frequencies of light. For example, we can create a smart filter for infrared cameras that allows the user to easily determine if the white powder in an envelope is baking soda or anthrax, determine if a skin melanoma is benign or malignant and find the sewer pipe in your basement without breaking through the concrete. These are just a few applications for one device; metamaterials in general are far more powerful. What scientists call "light" is not just what we can see, but all electromagnetic radiation - from low-frequency radio waves to high-frequency X-rays. Normally, light moves through a material at a slower speed. For example, visible light travels through glass about 33 percent slower than it does through air. A material's fundamental resistance to the transmission of light at a particular frequency is called its "index of refraction." While this number changes with the light's frequency, it starts at 1 - the index of refraction for a vacuum - and goes up. The higher the index, the slower the light moves, and the more its path bends. This can be seen when looking at a straw in a cup of water (see below) and is the basis of how we make lenses for eyeglasses, telescopes and other optics. Scientists have long wondered if they could make a material with a negative index of refraction at any given frequency. That would mean, for example, that light would bend in the opposite direction when entering the material allowing for new types of lenses to be made. Nothing in nature fits into this category. The properties of such a material - were it to exist - were predicted by Victor Veselago in 1967. These odd materials have properties that look very strange compared with our everyday experiences. In the picture below, we see two cups of water, each with a straw in it. The picture on the left is what happens normally - the section of the straw in the water appears disconnected from the part of the straw that is in the air. The image is displaced because air and water refract light differently. 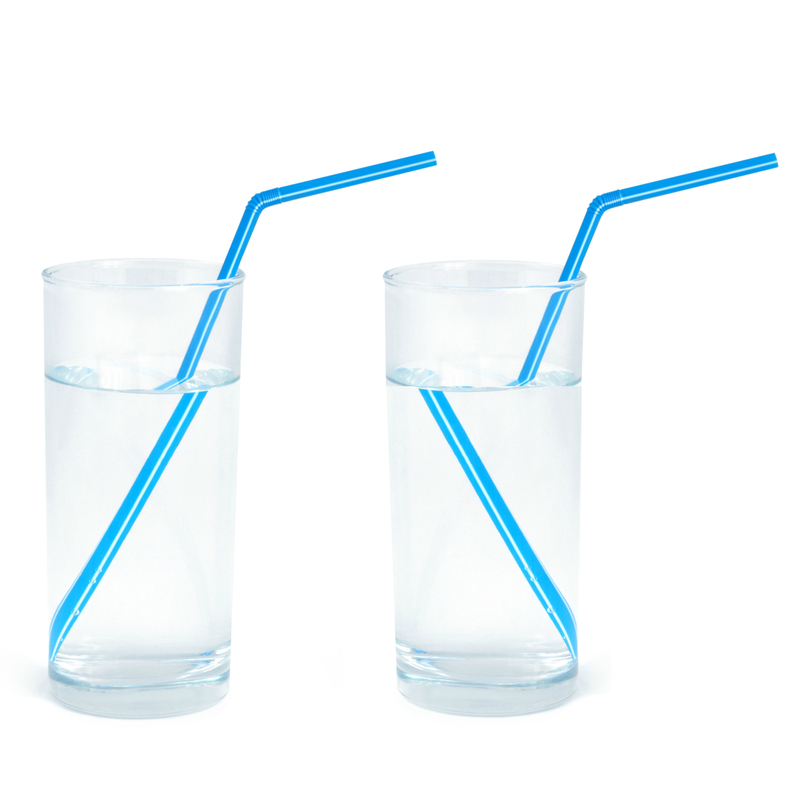 The image on the right indicates what the straw would look like if the fluid were a material with a negative index of refraction. Since the light bends in the opposite direction, the image is reversed, creating the observed illusion. At left: normal refraction. At right: with simulated negative refraction. While Veselago could imagine these materials in the late 1960s, he could not conceive of a way to create them. It took an additional 30 years before John Pendry published papers in 1996, 1998 and 1999 describing how to make a composite man-made material, which he called a metamaterial. An early metamaterial using repeating elements of copper split-rings and copper wires. This work was followed up experimentally by David R. Smith's group in 2000, which created a metamaterial using copper split-rings on circuit boards and lengths of copper wires as repeating elements. The picture below shows one such example produced by his group. 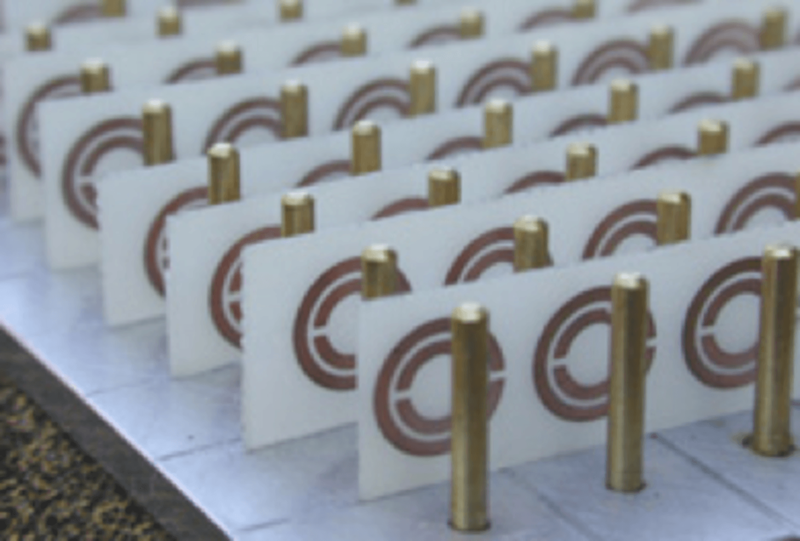 The size and shape of the split-rings and copper posts determines what frequency of light the metamaterial is tuned to. The combination of these components interacts with the incident light, creating a region with an fully engineered effective index of refraction. At present, we are only able to construct metamaterials that manage interactions with very specific parts of the electromagnetic spectrum. 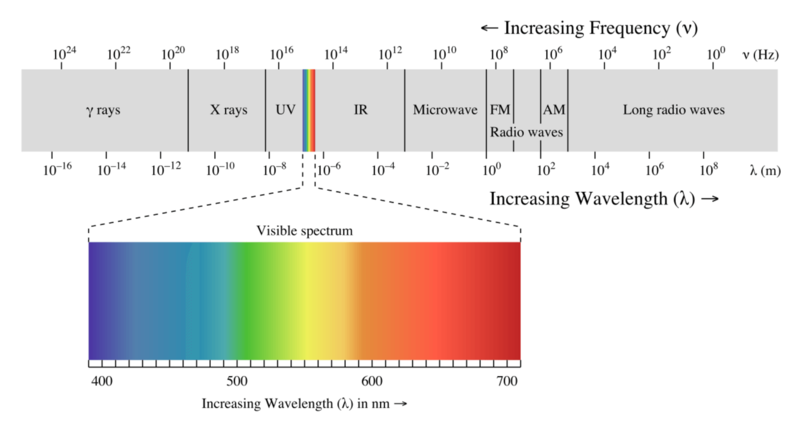 The electromagnetic spectrum, showing all types of light, including the narrow band of visible light. Smith's group worked initially in the microwave portion of the spectrum, because working with larger wavelengths makes metamaterial construction easier, as multiple copies of the split-rings and pins must fit into the space of one wavelength of the light. As researchers work with shorter wavelengths, metamaterial components need to be much smaller, which is more challenging to build. Since the first experiments, multiple research groups have made metamaterials that work in the infrared; some are skirting the fringe of the visible portion of the spectrum. For these short wavelengths, circuit boards, copper wires and pins are far too large. Instead the structures have to use micro- and nano-fabrication techniques similar to what is used to make computer chips. Soon after the first metamaterials were fabricated, researchers began engineering applications for which they would be useful. One application that got a lot of press was the creation of an "invisibility cloak." Normally if a microwave radar were aimed at an object, some of the radiation would absorb and some would reflect off. Sensors can detect those disturbances and reconstruct what the object must have looked like. If an object is surrounded by the metamaterial cloak, then the radar signal bends around the object, neither being absorbed nor reflected - as if the object were never there. By creating a metamaterial layer on the surface of an object, you can change what happens to the light that hits the object. Why is this important? When you look at a still pool of water, it is not surprising to see your reflection. When you point a flashlight at a pond at night, some of that light beam bounces off onto the trees beyond. Now imagine you could coat the surface of that pond with a metamaterial that worked for all the visible spectrum. That would remove all reflection - you wouldn't see your own reflection, nor any light bouncing into the woods. This type of control is very useful for determining specifically what type of light can enter or exit a material or a device. For example, solar cells could be coated with metamaterials that would admit only specific (e.g., visible) frequencies of light for conversion to electricity, and would reflect all other light to another device that collects the remaining energy as heat. Engineers are now creating metamaterials with what is called a dynamic response, meaning its properties vary depending on how much electricity is passing through it, or what light is aimed at it. For example, a dynamic metamaterial filter might allow passage of light only in the near infrared, until electricity is applied, at which point it lets through only mid-infrared light. This ability to "tune" the responsiveness of metamaterials has great potential for future applications, including uses we can't yet imagine. The amazing thing about all of the wondrous possibilities of metamaterials' interaction with light is that the principle works much more broadly. The same mathematics that predict the structure needed to produce these effects for light can be applied to the interaction of materials with any type of waves. A group in Germany has successfully created a thermal cloak, preventing an area from heating by bending the heat flow around it - just as an invisibility cloak bends light. The principle has also been used for sound waves and has even been discussed for seismic vibrations. That opens the potential for making a building "invisible" to earthquakes! We are only beginning to discover how else we might use metamaterials and their underlying principles.